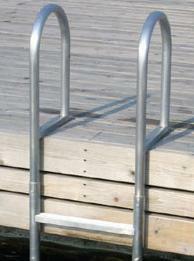 These durable Dock Edge ladders are ideal for sure-footed access to and from the water or boat and with a load capacity of 400 lb. and these rugged ladders will stand the test of time. Perfect for seawalls or dock applications with varying water levels. This is a 5 step ladder.